Use less amount of playing cards (e.g. half the number) than the reading cards. The Reader reads from a greater number of reading cards (e.g. all of them). This also increases the chance of mistakes. 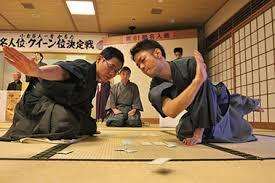 The cards that is read without a corresponding playing card, is called “Karafuda” (empty card) in Japanese. The third time a player touches an incorrect playing card he is disqualified from continuing the game. When the game is played at home or in school the rules of the game as presented previously suffice. 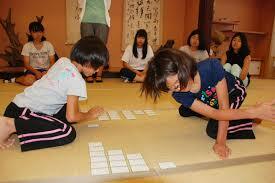 But when official tournaments in Kyogi Karuta(competitive karuta), are played in Japan, more detailed rules apply. For example there is a rule about Otetsuki (foul): In Kyogi, you are allowed to use only one hand throughout the whole game. You must decide which hand to use before the game starts. There is a penalty if you touch a card with the wrong hand. You can also touch the wrong card – given that the wrong card is lying on the right side of the playing area where the correct card is lying (!). 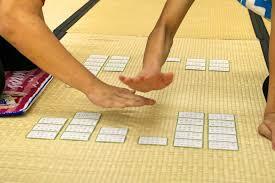 There are also rules about exact measurements for how the playing cards are placed, how the players sit and bow etc. 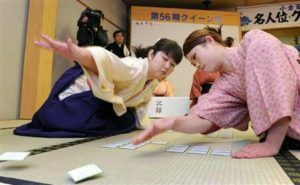 The homepage for Karuta Club München (Munic) presents a wonderful explanation inculding rules (in German) for Kyogi Karuta.